Noah Hanifin, No. 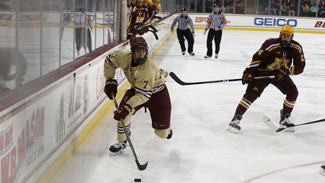 3 on NHL Central's final ranking of the top North American skaters eligible for the 2015 NHL Draft, completed his freshman season at Boston College in Hockey East in 2014-15. The 6-foot-3, 203-pound left-shot defenseman had five goals and 23 points 37 games. He also represented the United States at the 2015 IIHF World Junior Championship. He had eight goals and 33 points in 45 games for the United States Under-18 National Team Development Program in 2013-14. The native of Norwood, Mass., has offered to maintain a blog for NHL.com leading up to the 2015 NHL Draft in Sunrise, Fla. This latest entry came after his college hockey season. I would say as a whole, I could not have been more grateful for my experience this first year at Boston College. Aside from obviously learning from some of the top minds in our game, what I appreciated most was learning a schedule of balance. The time dedicated to practice and training is a lot, but the demands our academics places on us can be difficult if you don't have your own system of balance in place. Working with head coach (Jerry) York, coach (Greg) Brown and coach (Mike) Ayers has been extremely valuable. Coach Brown has a heavy hand in our defensive scheme, so I spent a lot of time working with him. Anytime you're able to learn from someone with the experiences he's had is so valuable. As a team, we obviously wanted to extend the season a little bit longer, but we have a great group and I'm excited for what the program will look like in the next year. We have some very strong talent coming in. The senior leadership has been helpful for me as a freshman, not only on the ice, but in trying to get those systems of balance in place. The NHL Combine is right around the corner. In addition to taking a couple classes, I'm spending a lot of time training on my own. I'm skating in the mornings and honing my skills at shooting clinics and things like that. I'm just trying to stay motivated every day and progress as an overall player. I definitely will partake in all sorts of testing that's required. I can't believe the NHL Draft is a little over a month away. It's all starting to hit me as the draft draws near. I just have to keep reminding myself that projections don't meant anything and rankings don't help me get any better. I've worked hard to get to the point I'm at now, but I need to work even harder if I eventually want to excel at the next level. I'd be lying if I said I didn't have butterflies in my stomach during the NHL Draft Lottery. But the draft lottery doesn't guarantee my destination. It was actually enjoyable. I was able to make it out to Toronto for the festivities and I met with a lot of people. I did an interview alongside Connor McDavid with a ton of media. That was nerve wracking, but I'm glad I was able to experience it at that time. I hear what people are saying and how Arizona has the third pick in the draft right now but that doesn't mean anything. I can't say I've ever been to Arizona but I know that's a good organization with a strong fan base.